Wagners Retail Ready Program is specially designed for independent garden centers and other garden retailers in the greater Minneapolis-St. Paul area. We have many years of experience growing finished annuals for our own retail stores and are known for high quality plants. We offer a wide variety and sizes of annuals to meet the needs of your customers. 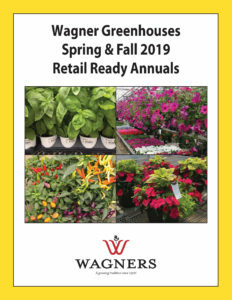 Wagner Greenhouses is excited to present our Spring & Fall 2019 Retail Ready program for independent garden centers and other garden retailers in the greater Twin Cities area. Our 2019 plant selections have been specifically chosen for retailing and gardening success in the greater Twin Cities area. Please contact us for more information and pricing.